Danube Bike Ride from Vukovar the brave to Novi Sad the shellsuit. Today was a ride of contrasts from the dispiriting visit to a city still in ruins with very little hope of returning to it’s former glory and also visiting where 200 people were massacred and another bus load went totally missing to the prosperous second largest city in Serbia and its beautifully paved streets, handsome buildings all beautifully lit and groups of American tourists. What is worse from all that I’ve heard it wasn’t a civil war it was just a pure and simple land grabbing exercise by Serbia for which Vukovar paid a terrible price and this has all taken place in the last 20 years. Ovcara is a short detour from the E6 but well worthwhile, the place where the 200 were held has been made into a beautifully simple but deeply moving place, from the embedded bullet shells in the floor to the 200 lights in the ceiling acting as stars and images of the deceased being lit up around the walls to their physical effects in the straw around the floor edges. Totally gut wrenching stuff. 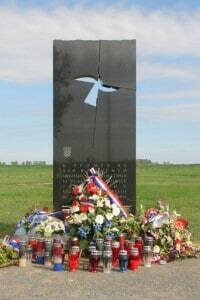 I also visited where the mass grave was, since it was on the way back to the E6, once again very moving I particularly liked the simple broken headstone sculpture created by Drinkovic with its polished engraved front and the bullet holes in the rear, just like the people who were shot. First impressions is that Serbia is very poor & the stretch of road cycling between the bridge and Celarevo is a nightmare. However, once you turn right and get on the embankment there is no traffic but it would be a total gooey mess if it had been raining. Today was dry and OK after a while it turns into a gorgeous smooth bikeway into Novi Sod unless a mountain bike plonker rams into you and takes out a spoke and hurts your knee 🙁 Novi Sad on the other hand seems a very prosperous city beautifully lit up and large public squares full of tables etc. I found The Veliki Hotel purely by chance, it seems very good & the receptionist found a bike shop for me, so within an hour the wheel was fixed and also a new tyre fitted. In all I did over 68 miles today but probably the actual route was only 60 miles. 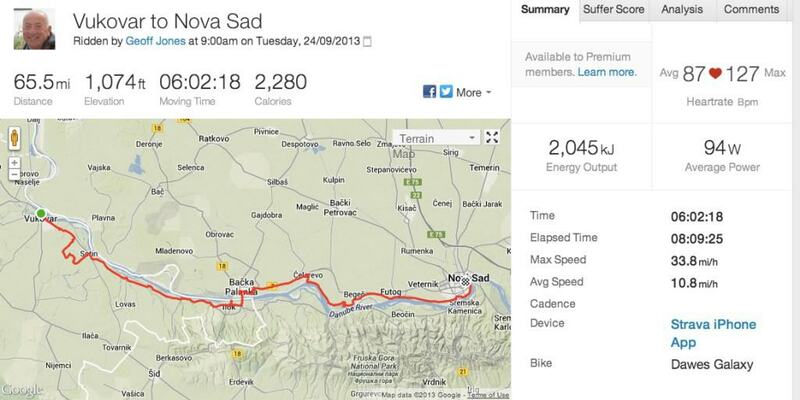 Here is The Strava and the pictures.